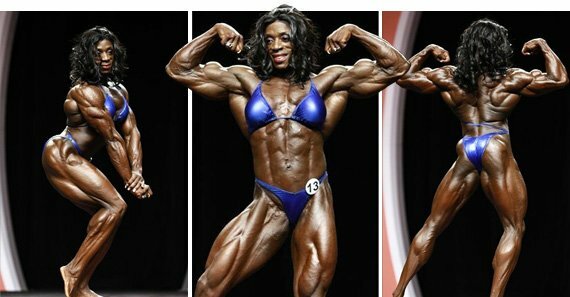 Iris Kyle won her eighth Ms. Olympia, tying the great Lenda Murray! It’s clear that Kyle is the queen of women’s bodybuilding. Women's bodybuilding never ceases to impress me. The ladies took the stage tonight; as expected, they only got better! Iris Kyle managed to win her eighth Ms. Olympia title, matching Lenda Murray's record. The champ made her mark in history, and she seems unstoppable. She lost once before, but will it happen again? Only time will tell. For now, Iris Kyle remains the undisputed champion. Sheila Bleck took sixth place. Her conditioning, symmetry, and shape definitely solidified her great finish. Brigita Brezovac was awarded fifth. She looked amazing; she was full and hard. Her conditioning was also very good. Alina Popa looked better tonight than she did in prejudging. She was a tad leaner, and her muscles were a bit fuller. She has classic lines with big lats, a small waist, and a good quad sweep. She took fourth. Yaxeni Oriquen-Garcia took third. As I thought, she seemed to have sacrificed too much size for her razor-sharp condition. She was absolutely shredded, but she looked somewhat small. She was not happy with the result, but that will help her in the long run. She can use it as motivation for the next show. Debi Laszewski nailed her conditioning. She was full and vascular. This is by far the best Debi has looked. While it wasn't enough to push Debi to first, she still managed to finish in second place. If anyone can beat Iris in the future, it's Debi.